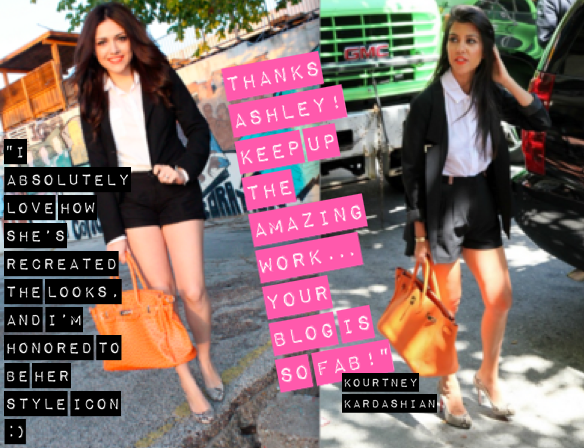 Kourtney Kardashian Featured Me on Her BLOG! I found your blog through Kourtney's. You've got some great looks here, I'll definitely check it out again! Congrats! That is so exciting to be featured on Kourtney's site! Thanks! Yes super exciting especially when you don't expect it to happen. This is an amazing opportunity and accomplishment to add to your blog please make a button of it becasue that is an honor! Keep it up chica! OWW Ash!! that´s Amazing! congrats!! Amazing! Congrats! I think the Kardashian sisters have an awesome style! You have done a great job with those looks! wow congrats. thats something to be proud of! Amazing! Congrats with this and enjoy it ;) You deserve it! that's amazing!!!!! Great job recreating her looks!